YouTube is the most dominant streaming platform in the worldwide music business. According to estimates published in the IFPI’s Global Music Report, the video streaming platform attracted 46% of all music streaming listening time around the world last year (excluding China). Paid (subscription) audio platforms claimed 23% of total listening, according to the IFPI, with free audio streaming on 22%. Combined, then, audio streaming platforms were responsible for 45% of all listening – one percent behind YouTube’s estimated haul. Other video platforms, such as Vevo and Vimeo, were responsible for the remaining 9% of listening hours, according to the report. Sources close to YouTube have previously told MBW that the average YouTube user spends less than an hour consuming music a month on the platform. Such sources are likely to question the IFPI’s assertion in the above case. YouTube has also officially challenged the IFPI’s figures from elsewhere in its report. 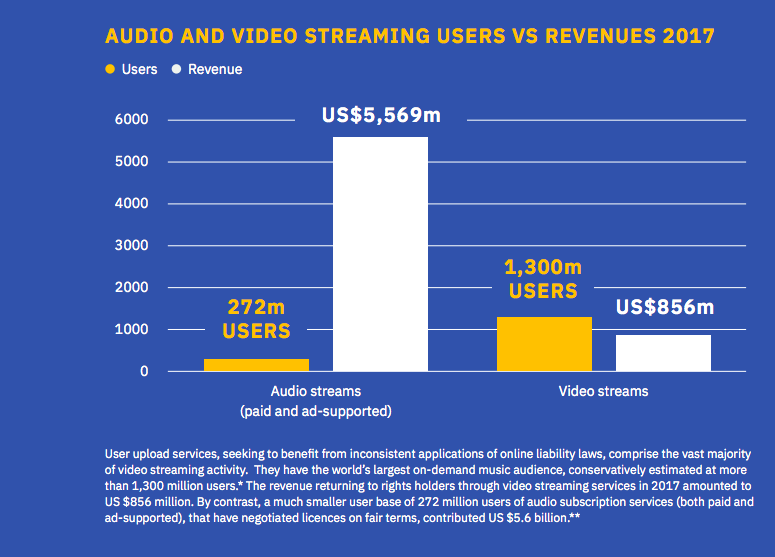 In another section of the Global Music Report, designed to illustrate the much-discussed ‘Value Gap’ in music, the IFPI claims that audio streaming platforms contributed $5.57bn to artist and labels last year, while video platforms (mainly YouTube) paid out just $856m (see below). $1bn is, obviously enough, significantly more than $856m. The IFPI also claims that audio streaming platforms attracted just 272m users in total in the year, while 1.3bn music-using users turned to online video services. The likes of Universal Music Group, Sony Music Entertainment and Warner Music Group signed new global licensing deals with Universal last year.